Chaos ruled the examination halls today at Delhi University with wrong question papers being given to the students who appeared for their first exam of the second semester this year. A constable of the Seventh Armed Battalion of the Delhi police was allegedly shot dead by another constable at the Police Training Centre in Malviya Nagar this morning. Two bodies, including a highly decomposed one, were found in two separate places of the national Capital this morning. Two people, including a Kerela-based teacher, were injured when a speeding BMW rammed into the autorickshaw they were travelling in at Mandi House today morning. People erupted in panic today after a call was placed to the police about an object that appeared to be a bomb, which was kept near the boundary wall of Bharatiya Vidya Bhavan. The Delhi Chief Minister Sheila Dikshit's assurance alone for an interim stay on Delhi Development Authority (DDA)'s eviction of the unauthorised slums in the Capital following a day-long protest today by the residents of several unauthorised colonies outside her residence will not be of much help, said the representatives under the banner of Ghar Bachao Morcha. The Municipal Corporation of Delhi (MCD) today ordered to relieve the staff of undivided corporation by tomorrow so that they can join their respective civic bodies immediately. A 45-year-old driver in the Army was killed after a Delhi Transport Corporation (DTC) bus rammed into the rear of the motorcycle that he was driving at Welcome in North-East Delhi today. The Vice-Chancellor has ordered a probe into the matter. Errors were identified in Sanskrit, English, Hindi and Tamil papers that collectively affected thousands of students. In a major goof-up, BA (H) students who were to appear for the English Credit course on contemporary English got a question paper on "Individual and Society" that wasn't a part of the syllabus. Similarly, for non-Sanskrit (Hons) students who were to appear for their concurrent paper on nationalism and Indian literature, were supplied the wrong version of the question paper. Hindi students were also left miffed when a 2-hour question paper marked for 50 marks arrived, while they were awaiting a 3-hour paper marked 75 marks. While the teachers today blamed the examination branch for these embarrassing goof-ups, the university shot back saying that "initial investigations in the matter have revealed that both the Sanskrit and English departments had set the wrong question papers. "The head of department of Sanskrit has submitted a written and signed note acknowledging the error committed by the department by setting the wrong question paper. “In all the three errors brought to our notice, the university is currently in the process of setting up a detailed enquiry to fix responsibility of individuals," said DU Vice-Chancellor Dinesh Singh this evening. However, in the morning, it was the students that bore the brunt as they sat waiting for the correct question papers. After the examination branch was informed, the correct paper which wasn't printed was faxed to colleges. They were asked to make photocopies and distribute amongst the students. The delay at colleges varied drastically, with some colleges getting the paper by 10.30 am, while many others began the exam as late as 11.30 am. Vineeta Chandra, English Department, said, "Whether it is the exam branch or the department, the students had to suffer. This isn't the first time that such an error has occurred. The entire system is in tatters, that is why these lapses occur again and again. There should be better collaboration otherwise the students will continue to be affected." The Vice-Chancellor, Dinesh Singh, today clarified that the Examination branch is essentially a facilitator that accepts the material supplied by the department related to the question paper and prints it. Taking the moral responsibility for the goof-ups, Singh said that the English Department is currently being pursued in the matter. "The examination branch ensures the moderation of the papers by the department concerned and only prints it after the department signs off the final version of the paper. The primary responsibility in preparing the question papers resides with the departments concerned as the matter deals with their discipline and all technical aspects," said an official statement issued today. Citing the reasons at the delay in handling the issue today, the exam branch officials today said, "We tried emailing the scanned copies. But, more than 10 emails bounced back. 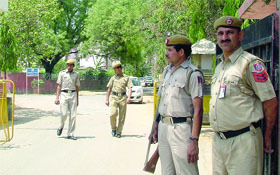 Constable Dinesh Kumar (22) was recruited in the Delhi police in 2010. He belonged to Bikaner in Rajasthan. He was staying with other police personnel, including the accused, constable Sunil Kumar (22), at the barracks of the training centre. According to the police, constable Kalu Ram returned to the barracks after completing his patrolling duty this morning. He left his carbine rifle while having his meal. At 11 am inside the barracks, Sunil grabbed the rifle and allegedly fired a shot at Dinesh. "Sunil pointed the gun at Dinesh and fired a shot that hit him on his chest," said a police officer. The police personnel present at the site of the incident rushed Dinesh to the AIIMS Trauma Centre. Doctors there declared him brought dead. Sunil was arrested by the police. A murder case has been registered against him at the Malviya Nagar police station. "He knew that the gun was loaded. And yet he pointed the weapon at Dinesh and fired a single round. It is a case of murder," added the officer. 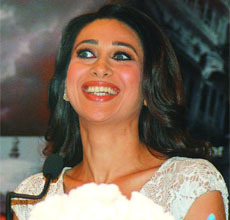 The officer hinted that Sunil was not cleaning the SLR at the time of the incident. However, the police is also investigating whether the accused had accidentally fired the gun. Sources said that he and Dinesh were good friends. They both were recruited in the Delhi police in 2010. Dinesh is survived by his mother, father and two siblings. His sister, Ritu who is a Ph.D. Student at IIT Delhi, said, "At 11.30 am today, the police informed me that my brother had been shot dead. My family is in Bikaner and they have been informed about the incident. They will arrive in Delhi in the evening. The postmortem will be conducted after their arrival." In the first instance, the police found a highly decomposed body of a youth from a drain behind Bhim Rao Ambedkar College at Jyoti Nagar. The police also found a complaint copy about a missing mobile phone. The identity of the youth was established by the copy. The body is of a youth named Bittu. He worked as a Class 4 employee at Parliament. He belonged to Bagpat in Uttar Pradesh and stayed at the servant quarters of Parliament. Sources claimed that Bittu went missing on Friday. He had last spoken to his family the same day. The police has preserved his body at the Guru Teg Bahadur (GTB) Hospital for a postmortem. It is presently investigating the matter. In the second incident, a man's body was found hanging from a tree at Yamuna Khadar in the morning. The police was informed about the incident at 11 am. The man is yet to be identified. Sources claim that he is around 30-35 years of age. His body has been kept at the Sabzi Mandi mortuary. 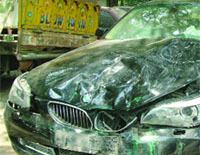 The BMW driver, Ravinder Singh, a resident of Chirag Dilli, was arrested from the site of the accident. He was later released on bail in the evening. The accident occurred at 8.30 am. Singh was heading towards Mandi House from India Gate. The auto-rickshaw was moving towards Madhavrao Sindhya Road. The car rammed into the rear of the auto-rickshaw, causing it to overturn. The teacher, Sunita (35), and the autorickshaw driver, Vijay, were injured. A passerby informed the police which rushed the injured to Ram Manohar Lohia (RML) Hospital. The police will take their statements after they are medically fit. A case of rash and negligent driving has been registered against Singh. His car has been impounded. Singh runs a firm by the name of Sunrise Outwards Private Limited. The call made to the police was a hoax and it was a fake bomb. However, the police evacuated the premises of the place where the thing had been kept. The bomb squad with sniffer dogs was called to check the object. The police said that the bomb was made from a video game carton. The person who played the prank also wrote a message on an A4 size paper. The message read that he had placed a bomb near the main gate of the institution, Bharatiya Vidya Bhavan. The staff of Bhavan staff noticed the paper and informed the police, who is trying to search for the culprit, responsible for the prank. According to them, the arbitrary criterion of 1998 cut-off deprives inhabitants of an estimated 250 unauthorised slums in the national Capital from qualifying for rehabilitation after their houses are demolished by DDA. "We want the cut-off date to be extended to 2012 so that the poor living in the slums get their basic housing rights. The pro-poor policies, be it the housing or the minimum wages, have never been implemented. “Even as these people, mostly migrants and engaged in the informal sector, form the main service provider, they are the ones whose basic rights are denied," said Alok Kumar, convenor of the above slum settlements body. The shadow of demolition continues to haunt the poor people of the unauthorised slums, not recognised by the DDA in the Master Plan of Delhi. Pointing out at the disparity and the divide between the slum population and the privileged class, they noted that the urban poor remain the invisible part of the population occupying just three per cent of the city's land even as they constitute nearly 27 per cent of the city's total population vis-à-vis the rich who are five per cent of the population still holding 50 per cent of the Capital's land. The fact that most of the space created by razing of slums is used for construction of malls and high-rise buildings shows that housing the poor people of the slums has never been a priority for DDA and the government, feels the section. Though Dikshit has promised that her government will further look into the ways to revise the cut-off date, the section is planning to go for a larger protest against the Urban Development Ministry by the month-end. The director (personnel), Gaj Mohan, said that the staff had been divided into the three newly created corporations - North, South and East Delhi. The responsibility of ensuring proper shifting of records to the sections concerned of the newly created bodies has been allocated to nodal officials who would be appointed by the head of the departments (HoDs) of the corporations. The nodal officials would facilitate the receipt of records with proper acknowledgement and further distribution of the same to their sub-ordinate officials, said Mohan. AK Singh, Deepak Hastir, Kiran Dabral have appointed as additional commissioners of East, North and South Delhi Municipal Corporations, respectively, whereas Ravi Das, Anil Prakash and Vijay Prakash have been appointed as engineer-in-chief of South, North and East Delhi Municipal Corporations, respectively. The staff posted to the East Delhi Municipal Corporation will be relieved on priority. The nodal officials will also ensure proper shifting of original set of record to the Central Control Room (CCR). Mohan said that the HoDs would also monitor the shifting of their respective departments. All the staff will be relieved through the transfer module of the IT department so that their biometric ID containing employee code number, etc. could also be transferred accordingly. The deceased, Mukesh Kumar, was going to work on his motorcycle. The accident occurred at Maujpur Chowk in Welcome. The DTC bus was chartered to a school in Mayur Vihar. It was transporting schoolchildren. The bus rammed into the rear of Kumar's motorcycle. He died on the spot. His body was taken for a post-mortem to Guru Teg Bahadur (GTB) Hospital. It was later handed over to his family. Kumar was a resident of Ashok Nagar. The bus driver, Rampal, was arrested from the site of the accident.